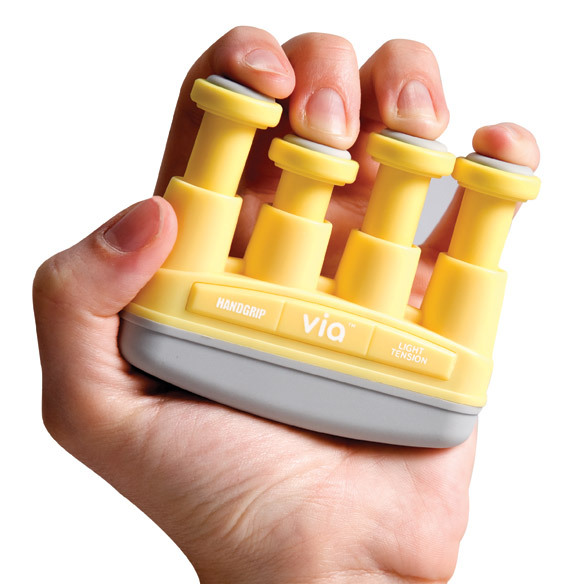 Light-tension hand exerciser strengthens hands and improves dexterity with 4 lbs. of resistance per finger. Exercise for hands is ideal for arthritics. Ergonomic design of hand exercise equipment has non-slip finger and palm pads 3 1/2" x 2 3/4". I just got this exerciser a little bit ago so haven't used it tons yet. It appears to work great. I found to fully press down I do have to use both hands at times as I can't grip it enough to depress the small fingers all the way. My guess is that this will resolve itself once those fingers are stronger. This is a fun, easy way to do a bit of exercise while watching TV, movies, or just sitting around. Bought it for my husband who has arthritic hands. I need it to strengthen my increasingly arthritic fingers. Need additional hand strength after surgery. Hand weakness. This helps a lot. To strengthen my fingers and grip. I have RA and crooked weak fingers so this helps me gain strength. To aid a friend engaged in occupational therapy. I have hand issues and my physical therapist uses this on me. To help with the pain in my hands. For my husband's golf game. I chose this item because I have trigger finger. need to improve hand strength especially in left hand.